Does it take a long time for hot water to get to your sink? Do you think that it’s wasteful to run the water for a minute or two just to be able to wash your hands? Have you thought about installing a recirculation system for instant hot water? If so, this unit might be for you. I had all these issues in my kitchen because the kitchen water run is quite a distance from my main water heater. So we just got used to washing our hands in cold water. And if we had to rinse some dishes and some needed hot water, we would turn the hot water on full and wait…and wait…and wait until some hot water came out the faucet. I knew there had to be a better way. For years I’d researched water recirculation units and found one, the Chillipepper, which people seemed to really like. However, I have granite counters and no convenient place to drill a hole for the power switch. I also have other fixtures on the kitchen water line and I didn’t want my wife to have to remember to push a button and wait for hot water. Finally, because I have long pipe runs from my water heater, this still wouldn’t solve the problem of wasted energy because gallons of hot water would be left in the pipes. After doing some calculations and determining that any solution using the main water heater would waste several times as much hot water as a point-of-use unit, I broke down and bought one of these mini-water heaters. Our house has a utility closet in the basement that is directly under the kitchen, so I mounted the unit in there. Plumbing was easy for me, but I’ve done a lot of plumbing work. Most people would need to hire a plumber to install the unit. But because of its size, installation is a snap. Some people will plumb the cold water intake to the heater from the hot water feed to this part of the house. There’s some logic in this, in that if you need lots of hot water, this heater can provide quick water for hand washing but if you need more water, it flows into the tank and provides you with a much greater supply than this little heater can provide. However this still leads to a lot of wasted energy because you’re leaving all that hot water in the long pipes every time you use a little water to wash your hands. Instead, I chose to connect it to the cold water supply. My logic was that the kitchen sink really should not be used for long washing sessions. rinse a stubborn dish or wash your hands and that’s it. I also had an ulterior motive – if there was only a few gallons of hot water available, it would force my family to use less hot water. Additionally, our washing machine is on this water circuit, and I prefer washing in cold water but my mother-in-law, who likes to come over and do our laundry (don’t ask!) is old-school, and insists on setting the washer to ‘hot.’ Now she gets the satisfaction of thinking she’s washing in hot, but I know the water heater can only supply a few gallons of hot, so it ends up providing the first few gallons of hot water for the primary rinse, but after that, it can’t keep up with the demand. I consider this a bonus energy saving! The unit uses normal 110v house current, so you just plug it in a nearby outlet. However, I would recommend a dedicated circuit or one that doesn’t have other heavy loads on it because electric water heaters pull a lot of juice. If the water heater turns on at the same time as you’re toasting some bread, you’ll blow a circuit breaker. So make sure you plug it in an outlet on a circuit that is lightly used. As far as heaters go, this is an attractive unit. As you can see in the picture, it has a white plastic case. Nothing special, but not just an ugly metal box like most. But really, it goes in a utility closet, so they could have painted it any color they wanted and I wouldn’t have cared! The main question is: does it work? The answer is “yes,” up to a point. We can now wash our hands and run the dishwasher (which has it’s own super-water heater built-in). As noted above, it also provides hot water for our front-loader washing machine, but because of its limited capacity (four gallons in this case) it won’t provide a lot of hot water. You can wash for a minute or two before the water runs luke-warm then cold. This can be a plus or a minus depending on your needs. I know some people would find this objectionable. But that’s just the way these things work. They enforce water conservation and force you to change the way you use hot water. If you don’t like this, then a small point-of-use water heater is not for you! Like all good geeks, I measured the actual electricity use of the water heater. Because it just plugs in an electrical outlet, I plugged it into my kill-a-watt meter, and make daily measurements to see how much energy it is actually using. I’ve been very pleased with the results so far. Under normal usage – rinsing a few dishes and regular hand washing in the kitchen sink, it consumes 1.5 to 2.0 kWh of electricity per day. This is about 1/3 the electricity that would be required if I used the main electric water heater and just “lost” the heat in the pipes every time I used the sink. On laundry days, this consumption increase by about 2-3 kWh (about 20 gallons of hot water). So we’d still be better off always washing in cold water, but some habits die hard…. Conservatively, I project that for my family, with it’s modest hot water needs, this unit is saving me about 4 kWh per day (about 25 gallons of hot water). That may not sound like much, but over the course of a year, that’s 9,000 gallons of hot water and about 1,400 kWh of electricity. For most people, that’s a full month of electricity saved every year. In my area, that’s a saving of $232! I’ve checked on Amazon.com, and this water heater cost $169 when I wrote this article, so it pretty much pays for itself in the first year if you install it yourself. If you hire a plumber, it may take a couple years to pay off. And, I haven’t included the ecological and financial cost of the water you’re saving. To avoid confusion, I should add that this is not an on-demand water heater. On-demand water heaters use much more powerful heating elements to heat water on-the-fly. They provide an infinite supply of hot water because they heat water as needed. The Ariston water heater is just a miniature storage tank water heater. So it’s the same as a conventional water heater, but tiny. Like any informed consumer, it probably raises red flags when you see someone reviewing an item then potentially profiting from it. I couldn’t agree with you more. For years, I refused to profit from any of the products I’d recommend to my clients for fear of conflict of interest. But then my wife convinced me otherwise. She said “you’re recommending these products because you buy them and believe in them, not because somebody is paying you to do it. How does it compromise your principles by gathering the products you recommend into one convenient place?” How could I argue with that logic? So now, whenever I find a cool product, most of which I’ve purchased for my own use, I look it up on Amazon. I check the reviews and make sure that the actual seller seems legit and then add it to my “store.” I don’t really have a real store. It’s just a convenient way of pulling together the products I’ve found and like. Question: What are your thoughts on solar heated water? Solar water heaters are one of the most underutilized alternative energy systems in the U.S. What could be better than reducing your energy consumption using the sun? Many other countries have “got it” and you’ll see solar water heating systems on most roofs. There are three problems with them – we charge too much ($7000-$10,000), there aren’t enough qualified installers and they require maintenance. But if sized and installed properly, most families could satisfy 75%-90% of their hot water needs using solar on any sunny day. Build it Solar – Site for solar DIY’ers. If you haven’t yet read my first posting about water heaters, I highly recommend that you do so now. Without that foundation, you’re not going to get the most out of this article. Let’s break this down into a few parts. What affects your bill? I’m going to address these points one at a time, because each one is important to understand and all impact your energy bills. This one is obvious. Reduce the amount of water you use and you directly cut your energy bills. But how can you cut back on hot water use? I’m assuming that you aren’t willing to change your lifestyle because most people aren’t. I mean seriously, if you’ve taken 20 minute showers your entire life, are you suddenly going to start taking 10 minute showers, even if you know it might save you $100/year? Probably not. Showers are one of the biggest consumers of hot water. Consider an older 4 gallon per minute shower head. That’s 60 gallons of water or maybe 40 gallons of hot water for each 15 minute shower. Ouch! That’s going to cost a fortune. If you can reduce that to 2 gallons per minute (GPM), you cut that to 20 gallons of hot water without changing your lifestyle. So the first act I would take is replacing the shower head. But before you rush out and buy new shower heads, you might want to measure the flow of your existing heads. Just turn on the shower and time how long it takes to fill a 5 gallon bucket then calculate the number of gallons per minute. Easy! 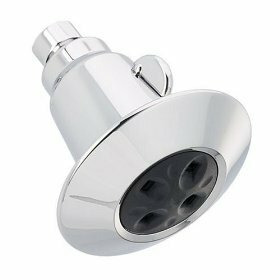 If you’re not already using a reduced flow shower head (1.5-2.5 gallons/minute) then invest in one. I’m not talking about the pathetic little ones they sell that couldn’t wash the soap off a bald man’s head. I’m talking about nice, designer shower heads, that are designed for efficiency. Things like this one. I’ve used one of these for years and love it. No, it’s not the most efficient one around, but it’s reasonably efficient and it actually works. If you’ve got teenagers who take really long showers, then get one of the 1.5gpm shower heads. They don’t work quite as well, but if they’re taking hour long showers, they can deal with a little inconvenience! If you’re feeling generous, you might get this one or this one. Usually, I don’t endorse getting rid of perfectly good appliances – in most cases, it’s just wasteful. But I make an exception for laundry machines. The new front loaders with high-speed spin-dry cycles are worth the investment on so many levels. 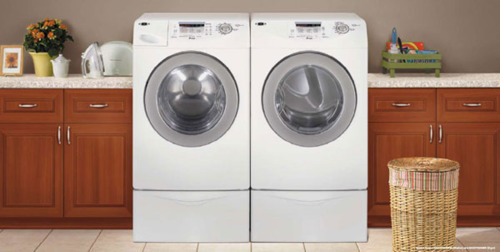 A typical, old style, top-loading washer requires filling the entire tub with water multiple times during the cycle, using up to something like 35 gallons of water. They’re incredibly wasteful! Add to that the fact that the clothes are still pretty wet after the spin dry and you’re paying a lot more to dry the clothes as well. Finally, those agitators are simply brutal on delicate clothes. In all respects, top loaders are simply destined for extinction. The front loader cuts your hot water usage very substantially. If you want a detailed discussion of them, go to the Energy Star website. They do require a little different usage, and special soap, but that’s a small price to pay for $100-$200 savings per year in reduced water use. They’re truly awesome! You’ve heard it before and I’m going to say it again – the most efficient usage of hot water is not using hot water at all. With modern laundry detergents, you do not need to wash clothes in hot water, and the savings can be hundreds of gallons per week if you do a lot of loads of laundry. That adds up to huge reductions in your hot water use over the course of a year. Ok, so maybe you’ll still use hot water for some things, like your kids white socks that they wear outside without shoes or their football uniforms. But for a typical person, hot water wash is a complete waste. Many homes are outfitted with whole-house humidifiers. These bolt on the side of your furnace and introduce water into the air stream to humidify your home during the winter. Unfortunately, some lazy product designers decided it was a good idea to run hot water through these units to help humidify the air because the hot water will be more “steamy” and work better. So what do these idiots do? They design a machine that runs something like 6 gallons of hot water through the system every hour, even when they’re only using a tiny fraction of that to humidify the air. Why? Because hot water is much more prone to scaling problems, so they run the water to flush out the mineral buildup! Over the course of a day, that humidifier can be doubling your hot water use, easily. So over the course of a winter of use, that’s adding hundreds of dollars to your utility bills. Horrible. Stupid. Wasteful. These things should be outlawed. If you’ve got one of these units that runs on hot water, disable it, shoot it, rip it off, and throw it in the trash. If you must have a humidifier (I’ll cover this topic in another post) then get one that uses cold water and a misting system or a sponge-like element. BTW – I wrote an entire post about central humidifiers and their evils. Remember to Fix those Drips! Remember – there’s no such thing as a small leak! Even a slow drip can be gallons per day which means hundreds of gallons per year. That’s dollars out of your pocket and wasted water for absolutely no reason. If you have a leaky faucet, fix it. Any homeowner should be capable of turning off the water supply and replacing a washer or faucet components. They’ve made it pretty easy for most things. So don’t hesitate. Fix the drip! Here’s a nice tutorial on the subject. And if you don’t like to read, here’s a video. Ok, I’m stopping here for the day. These have been the biggies and I’ve given you enough information to save you hundreds on your water heating bills each year. Now get busy replacing shower heads, buying new washers and dismantling your whole-house humidifiers! 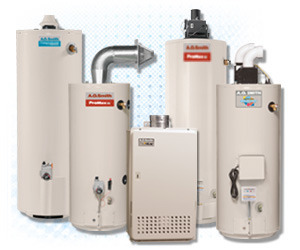 Water heaters – efficiency, insulation, costs…oh my! After my last try at this long post, I’m going to break this one down into a few parts. There’s lots of material here, so bear with me. Just how much energy does a water heater use? Is it as significant as people say? In a word – “YES!” – water heaters are a major consumer of household energy. No matter how you slice it, this is a numbers question, and I’m a numbers guy. So get out your spreadsheet and prepare to think about BTUs and Energy Factors! Let’s pull out a famous pie chart showing a comparison of average energy use for different things around the house. I grabbed this from the Energy Star website because they should know, right? Well, as it turns out, I don’t know what fantasy world they’re getting their numbers from, but by my numbers, water heaters are responsible for 20%-50% of your utility bills, and I’ll show you how. Here’s the problem – the answer to this question depends upon whether you’re a single person, living alone, who only showers once a week in tepid water, or if your household is multi-generational, with grandparents, parents, and seven children making loads of laundry every day. The occupants are the biggest factor in hot water use, so let’s look at them and how they affect the equation. On average, people use 25-50 gallons of hot water per day, per person, so right there, you have a wide range. Think about it for a moment…If you shower every day for 10 minutes, that’s 22 gallons of warm water per day. Wash your hands a couple times and you’re using another gallon or two. A load of laundry? 10-30 gallons, and so on. I emphasized “warm” water because most of the calculations I see count every use of water as all-out hot water, which is stupid. Nobody just runs the water on full hot unless they have their water heater set to a very low temperature. So when you take a shower, you might use 2/3 hot, 1/3 cold water. A 10 minute shower with a 2.5 gallon per minute shower head is 25 gallons of water but about 17 gallons of hot water. However, there are other complications. For example, every time you run the hot water, you’re filling up the pipes between your water heater and your spigot with hot water. When you turn it off, all the heat in that water is lost. So you might run the faucet for 30 seconds to get warm water in the first place, then use it for 30 seconds and turn it off. The heat in the water in the pipes is “lost”. Yes – lost. Some would argue that the heat goes into heating your home. Yes, true enough, you capture that waste heat during the winter. But during the summer? Oh…now that waste heat, usually 130 degree hot water, means your air conditioner has to work harder. It’s not so simple, is it? So for my calculations, I say that’s lost energy. These are all reasons why the spread of usage is so wide. But let’s be conservative and use 25 gallons of hot water per person per day. How much energy is that? Not so fast. How many people are in your household? Is it just you or do you have a family? For this example, I’m going to talk about a typical family of four. You can just multiply or divide the numbers based upon your own household size. As it turns out, if you run the numbers, and I have, you’ll find that using 100 gallons of hot water per day costs you between $50 and $100 per month depending on your fuel costs and a few other factors like the efficiency and temperature of your water heater. Without turning this into a thesis, let’s just say it costs $70/month for hot water. 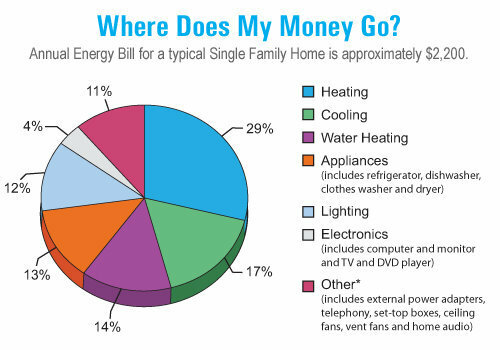 Depending upon the season and energy costs, the total monthly utility costs for a family of four will be $200-$400. Much more if it’s the dead of winter with an old oil boiler, less if you have a state-of-the-art geothermal heat pump. But this gives you an idea. So, if you’re on the low end of this, then the water heater accounts for 35% of the utility costs. On the other hand, it might be 10%-15% during the winter. But that gives you an idea of the typical ranges. When you cut through all the verbiage, you discover that hot water is a big deal. Typically it’s 20%-30% of your total utility costs when taken over a full year – maybe around $750. This means that you should look at water heating as a “high leverage” area for improving your home’s energy efficiency. I’ll touch on how to reduce your water heating bills in the next installment.